Built in 2018, by SENESCO Marine Incorporated of North Kingston, Rhode Island (hull #214) as the Bert Reinauer for the Reinauer Transportation Companies of Staten Island, New York. 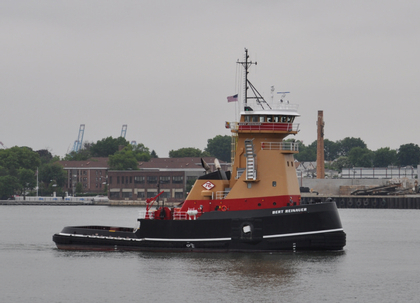 She was the fourth ATLANTIC II class tug designed by Robert Hill of Ocean Tug and Barge Engineering of Milford, Massachusetts for the Reinauer Transportation Companies. Powered by two, Tier IV compliant GE 12v250 Diesel engines. Lufkin reduction gears, at a ratio of 5.036:1. Turning two, five-bladed, fixed pitch propellers. She is a twin screw tug, rated at 8,400 horsepower. The tug is fitted with an INTERcon coupler system. The vessel's electrical service is provided by three 125 kW John Deere 6068 generators, with an emergency 99 kW John Deere 4045 SOLAS unit. The tug's capacities are 145,000 gallons of fuel, 10,000 gallons of fresh water, and 3,500 gallons of lube oil.